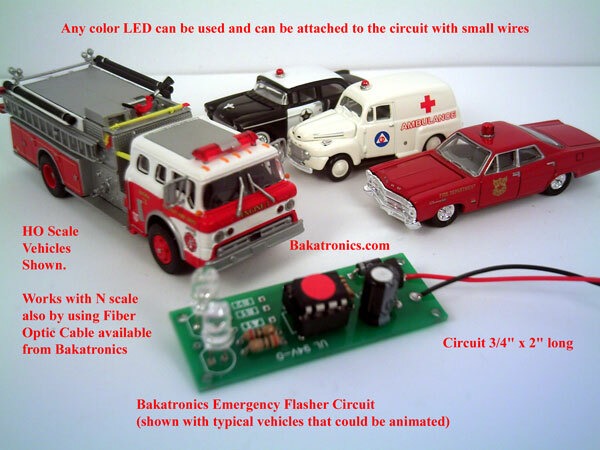 Emergency Vehicle Flasher / Strobe Light Kit, (requires assembly, but can be purchased assembled as an option). 3: Alternating Flasher. Slow flashes two LEDs then the other two LEDs. RR crossings, Police car headlights, barriers etc. 4: Flashes LEDs 1 and 4 on and off at the same time. Then LEDs 2 & 3 strobe rapidly between Flashes. Great for Highway Equipment where the LEDs are used as tail lights. Construction, Refuse trucks, Mail Trucks, etc. Circuit program also has a built in delay between sequences that can be activated with a switch or jumper wire. The completed circuit board is 3/4" wide, 2" long and about 1/2" high. The kit comes complete with Circuit Board, Components, 4 Super Bright 3mm Red LEDs a Pre-Programmed MicroController IC, 12" LED and Power leads and Assembly Instructions. This kit requires soldering to assemble the kit. A 15-30 watt soldering iron is recommended. Flashing, chasing, dimming, and LED display lighting kits! LED are a modern wonder that have many uses on the model railroad.